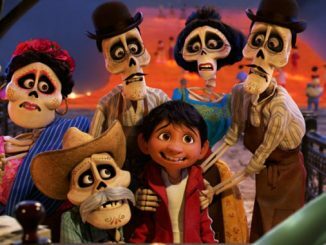 There is nothing offensive or deliberately awful about Nick Park’s latest animated film, but neither is there anything compelling or novel. 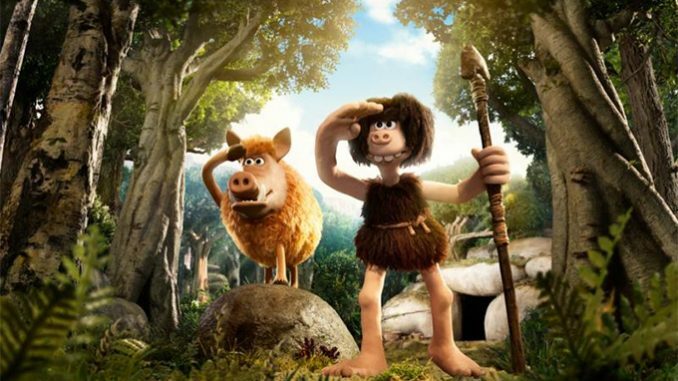 Early Man is the worst film ever made by the talented British animator, director, and writer Nick Park and his brainchild Aardman Animation. This may appear to be an overly harsh criticism, but that’s probably because all of Park previous creations—Wallace and Gromit, Chicken Run, Shaun the Sheep—were delightfully brilliant, and this picture is just bland, so terribly bland. I expect this from Dreamworks or Illumination, but Aardman is second only to Pixar when it comes to producing animated masterpieces. The story is simple and is set in simple times: the Stone Age. Dug (Eddie Redmayne) and his caveman tribe reside in a lush valley, situated in the heart of the crater created by the meteor that killed all of the dinosaurs. They pursue a peaceful life of hunting rabbits, making bathroom humor, and not much else. Suddenly, they are invaded by the villainous Lord Nooth (Tom Hiddleson), riding atop an armor-clad mammoth, who kicks them out and razes their home to mine the ore beneath. “The age of stone is over,” Lord Nooth smirks. “Long live the age of bronze.” Through a series of mishaps, Dug eventually ends up in Nooth village and discovers their love for soccer. He challenges Nooth’s local team to a match, with the winner to have possession of the coveted valley. At this point in the narrative I thought I could accurately predict that next two-thirds of the movie—and my expectations were met without deviation. (Spoiler alert!) Dug’s ragtag team is bad, they find a ringer, there is a montage showing the team becoming adept at the sport, Lord Nooth tries to cheat, there is a possible betrayal (but not really), and the tribe wins the day and eventually reconciles with their bronze neighbors. There’s even some gratuitous repudiation of the sexism and speciesism in sports, which is quite typical of modern children’s films. Yawn. What made Park’s Wallace and Gromit series so memorable was how the characters were both very original yet felt so familiar. The humor flowed from the unusual situations the odd couple found themselves in time and time again. Alas, Early Man has none of this. The characters are one-dimensional and the “humor” is just a series of corny jokes. The marketing campaign also was manipulative, emphasizing the soccer element for Europeans and the Neolithic aspect for American audiences (who are mostly apathetic about European football). There was more joy in the 30 second Shaun the Sheep trailer about aliens than in this entire movie. There is nothing offensive or deliberately awful about Early Man, but neither is there anything compelling or novel. It’s not just dull, but painfully dull. Painful, in large part, because one knows its creators have done so much better in the past. Breaking a stainless record can be advantageous, however, as it removes the burden of being perfect. Every great saint has some sins, and that’s partly what makes them good models and sympathetic figures. They pick themselves up, repent, and keep going. Again, if the trailer for Farmageddon: A Shaun the Sheep Movie is any indication, Park and Company have already learned their lesson.